Shanna at FunLove.com was kind enough to let me choose my review. There was tons of amazing products that I would love to review but one thing stood out from the rest. 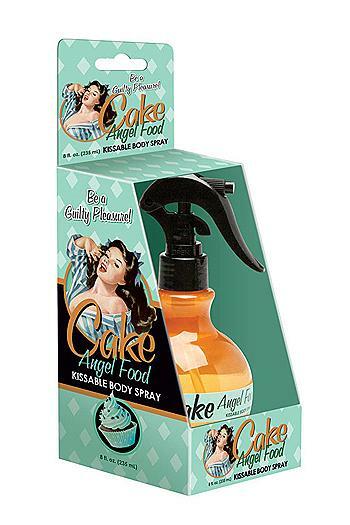 Angel Food Cake * Kissable Body Spray. the bottle is really cute and the package is so adorable! With a 30's style pinup girl for the icon of this package (which I love) It's soft blue and diamond shaped design and cute cupcake and writing that say's ( Be a Guilty Pleasure ) Love it! ♥ design stands out from the rest. 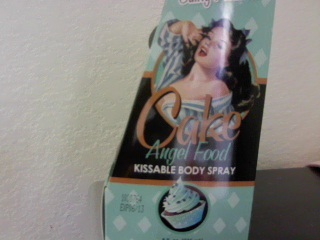 They have other fragrance options such as : Red Velvet, Cookie Dough, And Devil's Food. Yum! Would love those! It doesn't matter how much or how little you spray on it won't leave a sticky residue behind which is great! 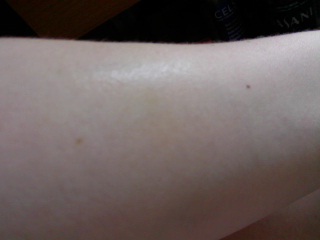 and it also goes on clear, no yellow streaks, spots or any coloration of any kind just clear. You won't even be able to tell you got it on through out the day untill you smell it. ♥ I receive no monetary compensation for this review. I was provided Kissable Body Spray to try and give my honest opinion. 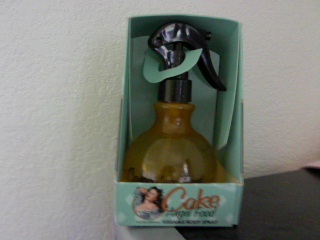 ..LOL I should have called it "Naughty Perfume"